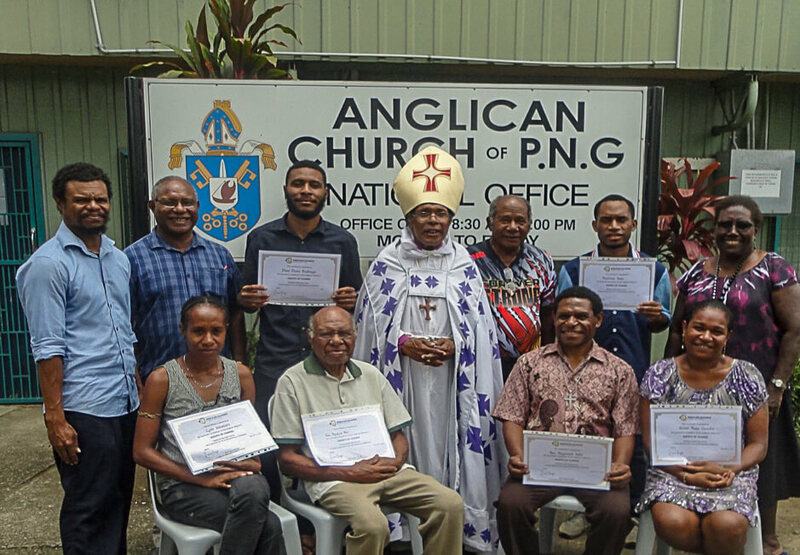 After months of hard work, eight participants from the Morobe Deanery of Lae, Papua New Guinea have successfully completed the Agents of Change community development course (find out more about the course here). Their success was celebrated at a special ceremony in Lae, presided over by Archbishop Allan Migi, the Primate of the Anglican Province of Papua New Guinea (ACPNG). Archbishop Allan blessed the certificates before presenting them to seven of the graduates. The group comprised a 70 plus year old retired priest, an archdeacon of Morobe Deanery, a senior church member and four youths. The eighth graduate, Mrs Dorothy Siep, was not able to attend as she lives a ten hour drive from Lae and has been awarded her certificate separately. 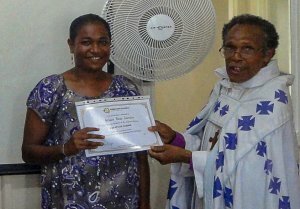 She is the first Mothers’ Union graduate from the region. 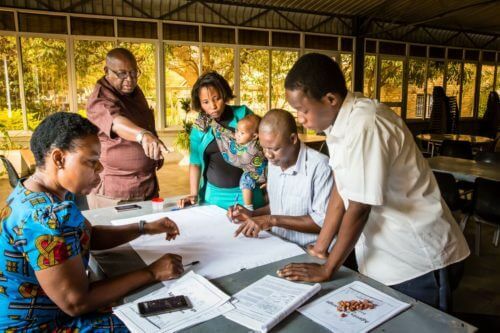 The group was mentored by Dennis Kabekabe, the Provincial Secretary of the Anglican Church of Papua New Guinea, who is himself a graduate of the course and played a key role in its development. Dennis was a source of constant support and encouragement to the participants, providing regular group meetings and offering additional drop-in sessions. Reflecting on the success of the graduates Dennis said, “The journey to this achievement was not easy. The participants had to overcome many challenges along the way but with perseverance and commitment they were able to complete all 8 modules. Individually they completed the 8 modules at different times since they started in June 2017. “The participants were inspired by the course content and by the biblical reflections that gave deeper meaning and purpose to the academic knowledge. How the course links up with the five marks of mission of the Anglican Communion worldwide has really inspired their thoughts on how they can implement the academic knowledge they have gained in loving service to their neighbours, in order to transform the lives of people in their communities in terms of their humanitarian or development needs. “The Agents of Change course has had a very big impact to my knowledge and my life as I move on. I am now seeing things differently; it has completely changed my mind set. I am very happy and thank the Anglican Alliance for this wonderful program” Dimo D Badirega (Youth), ACPNG. “The Agents of Change course has encouraged, motivated and given me strength to address issues affecting young people in my community. My aim is to help them find their purpose in life now. Thank you, Anglican Alliance” Stallone Ihove (Youth), ACPNG. When asked for their combined reflection on having completed the program, the group said that it was not easy and at times they were at the verge of giving up but acknowledged God’s divine leading in their lives that has sustained them all throughout their journey. 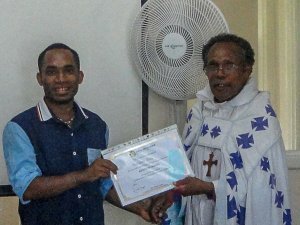 A few days after graduation, the seven from Lae were also presented to members of their congregation at their local parish of All Souls and St Peters, Taraka. They were well received by the parishioners. The group is now embarking on a parish census based on a tool learnt in Module 2. Find out more about the Agents of Change course here.